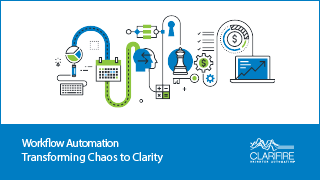 A leader in workflow automation technology for over a decade, CLARIFIRE® delivers a sophisticated, automated workflow engine that streamlines and integrates all of your business operations. Many workflow systems provide for automation of single processes. CLARIFIRE is designed for process-centric organizations and provides you an enterprise-wide solution, dynamically coordinating interactions across multiple departments and systems. The CLARIFIRE approach maximizes efficiencies, accountability, profitability, and most importantly, internal and external customer experience. Implementing this agile workflow automation platform provides timely compliance with evolving requirements and accelerates time to market, giving your organization a competitive edge — regardless of your industry. Armed with the versatile CLARIFIRE product features and SaaS delivery model, process-centric enterprises are empowered to automate workflow, optimize processes and bypass competitors who are slow to modernize. Our goal is to drive client success, helping organizations meet increasing demands for agility. Our team has extensive expertise in business process requirements, workflow automation, and the intricacies of the industries we serve. Understanding that our solutions are often mission-critical for our clients, we cultivate strategic relationships with our clients throughout every step of the planning, design, implementation, training, and post-implementation support process to ensure success. Clarifire clients include Fortune 500 companies, governmental entities and progressive privately owned companies that demand business process automation that aligns with their future state strategic operating models. The processes above are just the "short list." Contact us to discuss the many processes we have in our process library.